Important Note: Resources described on this page cover the years from 1608 to 1760. All the records described below are open; access restrictions do not apply. At the beginning of the colony, the commercial monopolies were responsible for its defense. No records are known to exist. New France was constantly threatened by the Iroquois Nation and unable to adequately defend itself. In 1665, the King of France sent the Carignan-Salières Regiment, consisting of 1,200 men. Once the danger of conflict had passed, the soldiers were encouraged to settle in the colony. About one third of them elected to remain as settlers. After the recall of the Carignan-Salières Regiment, the defense of the colony was left to the local militias, which were organized in 1669. The first permanent troops, the Compagnies franches de la marine, were organized in 1683. They were infantrymen and it was these troops who were responsible for defending all of France's North American colonies. The colonial officer corps in Canada was gradually staffed by men born in the colony, so that by 1755 nearly all the officers were Canadian. By 1757, there were 40 companies in Canada. The regular army in North America, the Troupes de Terre, staffed by French officers and men, was always very small. Seven of these regiments, along with 40 of the Compagnies franches de la marine, participated at the battle on the Plains of Abraham in 1759. It should be noted that throughout the years, soldiers who served in North America were encouraged to settle in the colonies when discharged. 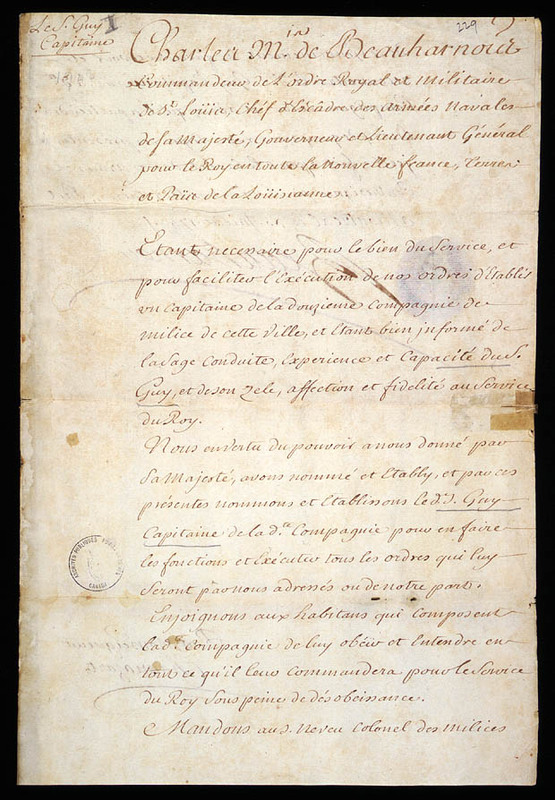 Few records relating to military service in New France have survived. The sources listed below may contain a few nominal rolls of soldiers, but most lists relate only to officers. They may give the age, place of origin, date of death and details about promotions, pay and pensions, land grants, and other legal documents. Use Archives Search to find other possible references by entering keywords such as name of a regiment, a place or a person or a subject such as "milice," "soldats," "officiers". The documents relate mostly to the officers. They include details about promotions, pay and pensions, land grants and notarial records. All able-bodied men aged between 16 and 60 years old were required to serve in the militia to support the regular troops in the defense of New France. Each parish had its company, led by a captain appointed by the governor; this captain played an important role in the social life of the community.